March 30, 2012  The Canadian penny is no more. At least, that's what was announced Thursday in the Canadian government's 2012 federal budget. Because of the rising cost of metals, it takes more than one-cent to mint a penny. March 29, 2012  The House debated the budget plan of Representative Paul Ryan, an ambitious blueprint that would cut taxes and spending. But some fellow Republicans still opposed it for not cutting the deficit fast enough. March 29, 2012  Workers walked off the job in Spain on Thursday, halting public transport, closing schools and leaving hospitals with emergency staff only. The general strike was called by unions in response to the conservative government's labor reforms, which let companies opt out of collective bargaining agreements and fire workers more cheaply. But more punishing austerity could still be to come, as Spain tries to whittle down its budget deficit under pressure from Brussels. March 29, 2012  In a "flash mob," hundreds of people invade a public space to do something in unison. 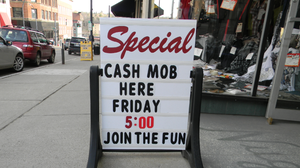 But a "cash mob" adds a mission to that idea. All over the country, crowds of people are being organized on social media sites to invade mom-and-pop stores at a specific day and time to spend money locally. Can A Small Town Survive Without Its Bank? March 29, 2012  Alburgh, Vt., is on a remote peninsula near the Canadian border. But even though the town is rural, it's always had a bank. So when its citizens learned the People's United Bank branch on Main Street was closing, they feared their community would turn into a ghost town. 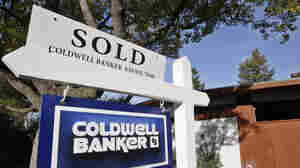 March 28, 2012  Housing prices are still falling nationwide, but some analysts see reason for optimism in the real estate market. Home listings are dropping closer to healthy market levels, and some real estate agents report more interest among would-be buyers. March 28, 2012  As social media grows, hiring managers have started to screen Facebook and Twitter accounts, as well as running criminal background checks for potential employees. Some employers are asking applicants to hand over Facebook passwords as well. 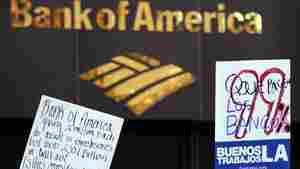 March 27, 2012  Groups within the Occupy Wall Street movement are trying to overhaul the banking system — and they even dream of a new kind of bank. One activist sees "a bank that would be democratic, that would be owned by its employees and by its customers." 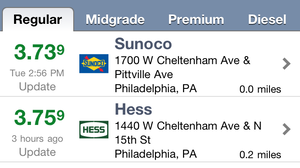 March 27, 2012  There were declines again in 16 of 19 metropolitan areas. The only places were there were gains: Miami, Phoenix and Washington, D.C.
Crime Goes Up In Budget-Strained Harrisburg, Pa.
March 27, 2012  The Pennsylvania capital Harrisburg is more than $300 million in debt. The budget is controlled by a state-appointed custodian. City and law enforcement services are under strain and residents worry violent crime may be growing. March 26, 2012  The American office furniture maker Steelcase is celebrating its centennial. At its peak in 2001, Steelcase employed 21,000 workers worldwide. Now that's down to 12,000. March 23, 2012  The governor appointed David Unkovic to save Harrisburg. Now he's being sued by some of the town's residents. 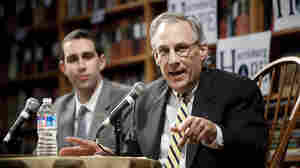 March 23, 2012  This week, a judge dismissed a lawsuit against New York Law School filed by some of its own recent graduates. They claimed the school's marketing misled them about their chances of getting jobs as lawyers. Robert Siegel talks with Frank Raimond, an attorney who represented them, about the impact of the ruling. Raimond has been filing similar complaints against other law schools across the country.